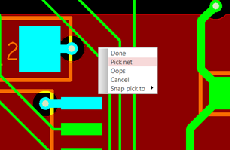 While working on a PCB layout in OrCAD PCB Editor or Allegro PCB Editor it happens, that you place a via with no connection to a net. There are several reasons for this scenario, maybe you want to use the via as a testpoint and the placement is predefined by the already existing test adapter or you have other reasons for the placement driven from the mechanical design. With the FloWare module Assign Net to Via you can assign easily any net to the stand alone via. If you now start routing from the via, it already has the net information and will behave accordingly.